This hike was intended to put me one step further towards my goal of hiking all the trails in the Clackamas district. 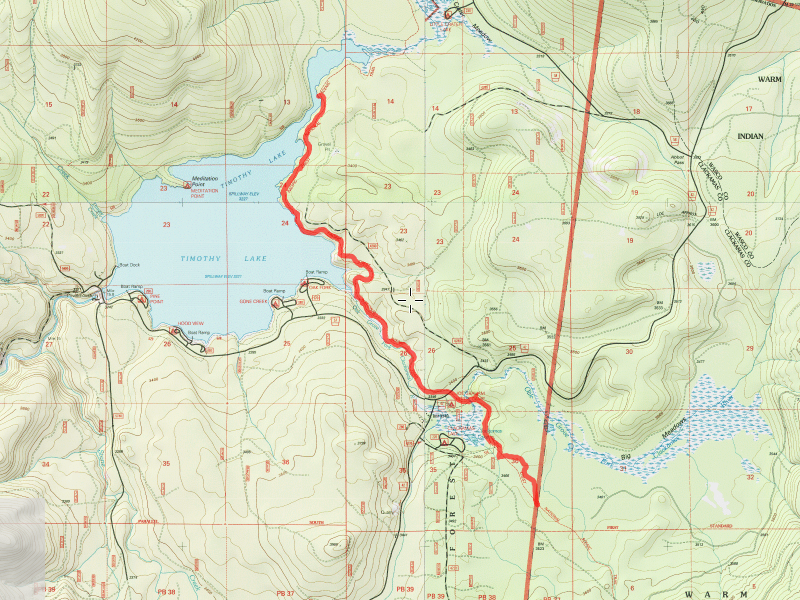 I had a hard time deciphering exactly where the Clackamas district ends and the Zigzag district ends, so I decided just to hike north on the PCT where it comes back into district near Clackamas Lake. I hiked up about 5 miles from where the reservation border is. I typically like lesser travelled trails mostly because I prefer the solitude and peace. This trip was QUITE different. 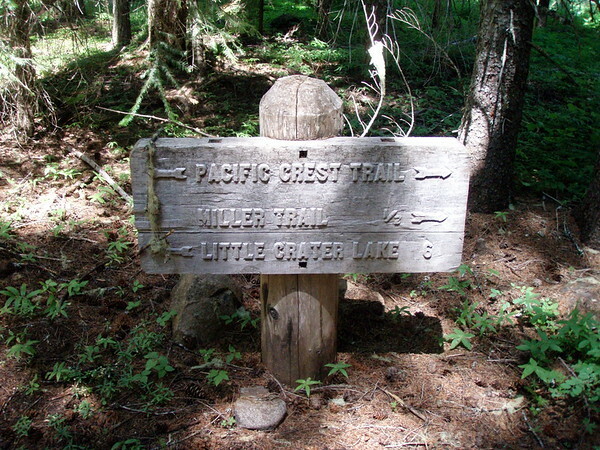 It is a nice trail – well maintained with some very nice scenery along the way. The day I chose however there was some sort of 50 mile “triathalon” race going on part of the PCT. They used a side trail (the “miller” trail) so I didn’t see them on the entire trip, but I did see a LOT of runners on the trip, as well as a few hikers, and a few horses. The day started off with LOTS of traffic (based on what I’m used to) up the Clackamas. I don’t think I’ve ever seen that many people there – I know this is prime season, and the weather was great. I guess I tend to hike more in the spring and fall and not during peak season as much. Things have just worked out the last several weeks where I’ve been able to hike. 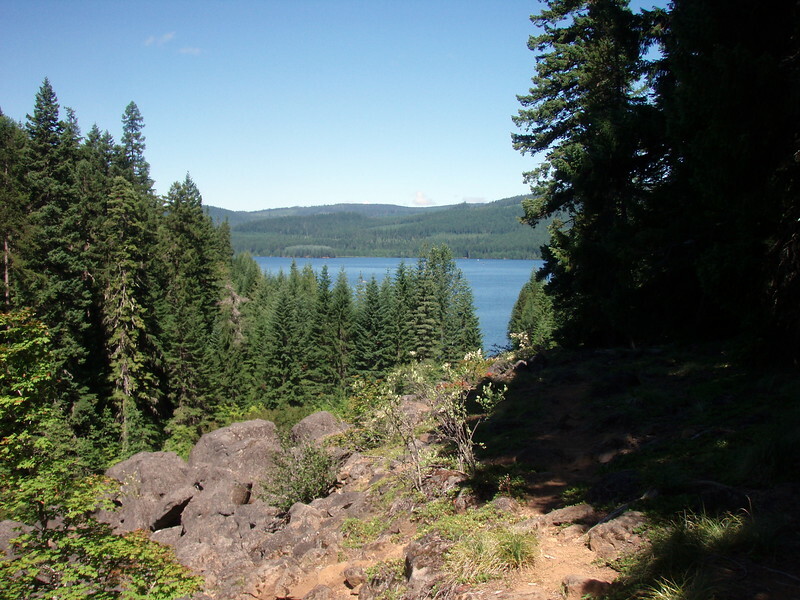 Once I got up to Clackamas Lake, I realized something was going on – there were cars EVERYHWERE, and I saw a “beware of runners crossing the road” on the way in. 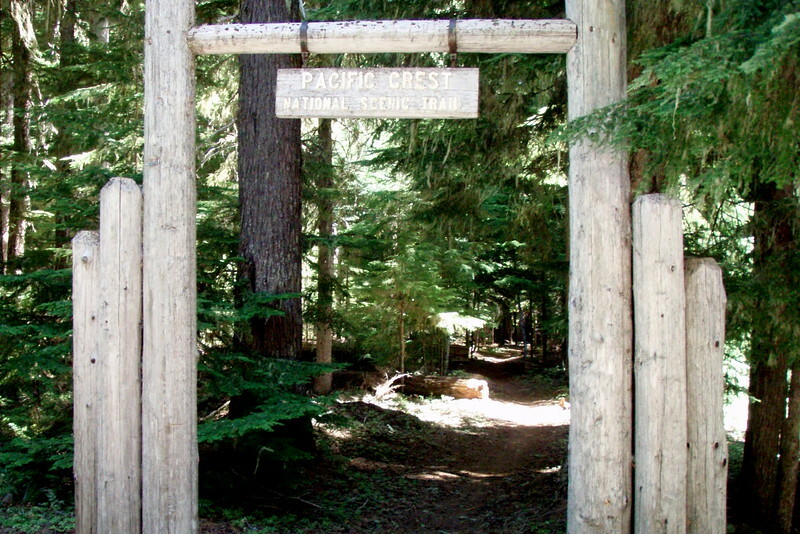 I also had to stop at the info station at Clackamas Lake to purchase a day pass – I haven’t had to have a day pass for several years now – I typically hike where they are not required (there aren’t enough people to make it worthwhile I think). So I bought my daypass and parked at the point where the PCT crosses Forest Service road 42 and headed north. The trail is in GREAT condition, with no logs down and the tread in fine shape. 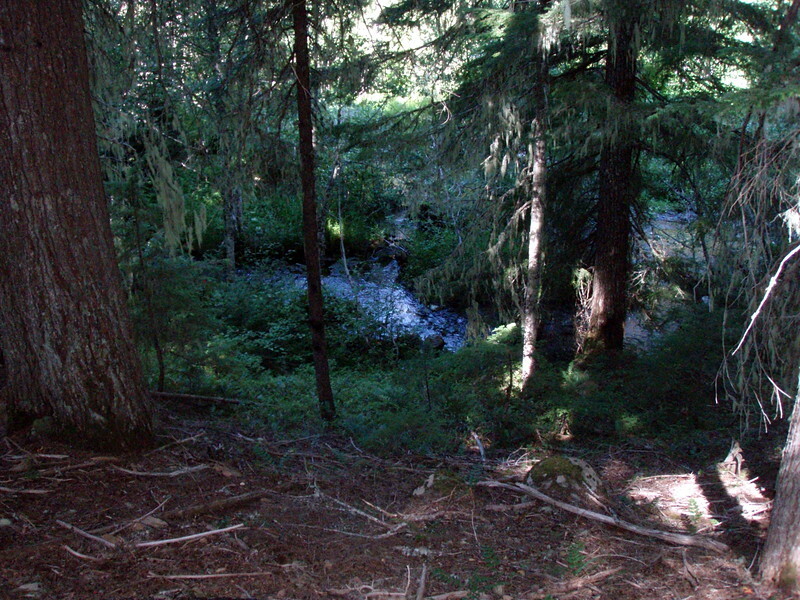 Shortly after starting, you come right beside a small creek, which I later learned is the Oak Fork of the Clackamas river. There is a great spot for nice cold water (a spring that feeds the river) just up the trail a bit and the trail pretty much follows the river until it dumps into Timothy lake. There is a neat rock slide and then a great viewpoint where you get your first glimpse of Timothy Lake. It is a pretty large lake, and it was VERY busy, both on the lake and campers around it. The trail mostly follows the shore of the lake, occasionally drifting away for a bit, and then coming back. There is quite a bit of large timber in that area, interspersed with smaller trees. Once we got to the spot where the runners were entering the trail, we had to stop quite a few times to let runners go by. Bodie isn’t the most sociable dog, and I normally don’t take him on hikes where I think there will be many other people, but I decided to take him on this day. He did really well – maybe he acts differently when he isn’t home – maybe he doesn’t have that protective instinct like he does at home. At any rate, I kept him on the leash, and he did fine. There were just a LOT of runners to deal with. About half way up the lake we stopped at a campsite on the shore and Bodie took the opportunity to lay down in the water to cool off. After a short break there, we continued up the trail. We kept hiking until the “finger” we were hiking next to got pretty narrow, and then looking at the mileage decided that was a pretty good turnaround point. So, back the way we came, passing runners and even a few horses! One group of horses seemed a little skiddish about us, especially Bodie, so I had to get further off the trail to let them pass. Even then, some of the horses walked off the OTHER side of the trail. They REALLY didn’t like him. The trip back to the 42 road was uneventful, however we did stop for some lunch after the point where the runners went off. The parts of the trail where the runners were running really didn’t have a lot of traffic on it. I probably saw 8-10 people and 5 horses with riders on those sections of trail. 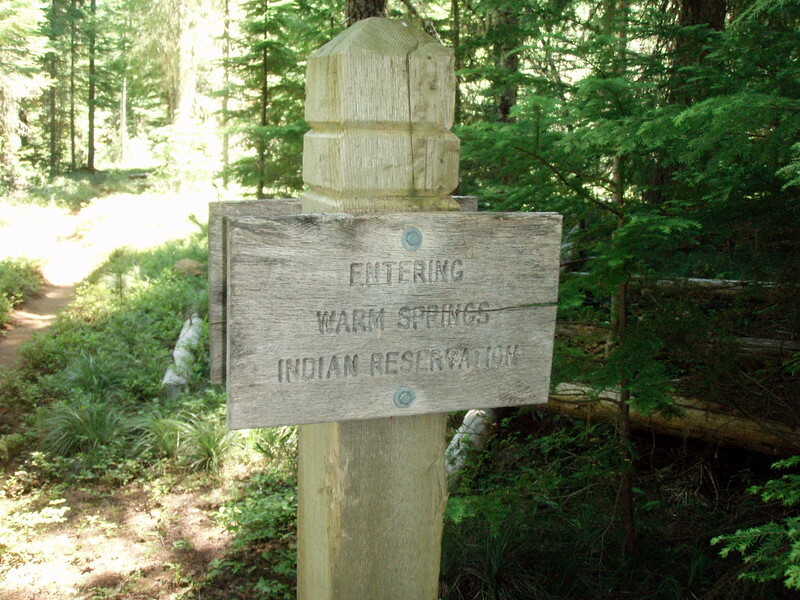 After arriving back at the starting point, the goal was to hike south to the Warm Springs Reservation border and then back. It was a little farther than I thought – I thought it was a mile or less, and it was almost a mile and a half I think. Not too bad, but after hiking 8 miles the previous direction, we were both starting to get tired. In retrospect, I should have hiked the south end first (when it was cooler) and then done the north half. I think we would have run into fewer runners, and we wouldn’t have been quite so tired. oh well, hindsight is 20/20. It worked out OK. 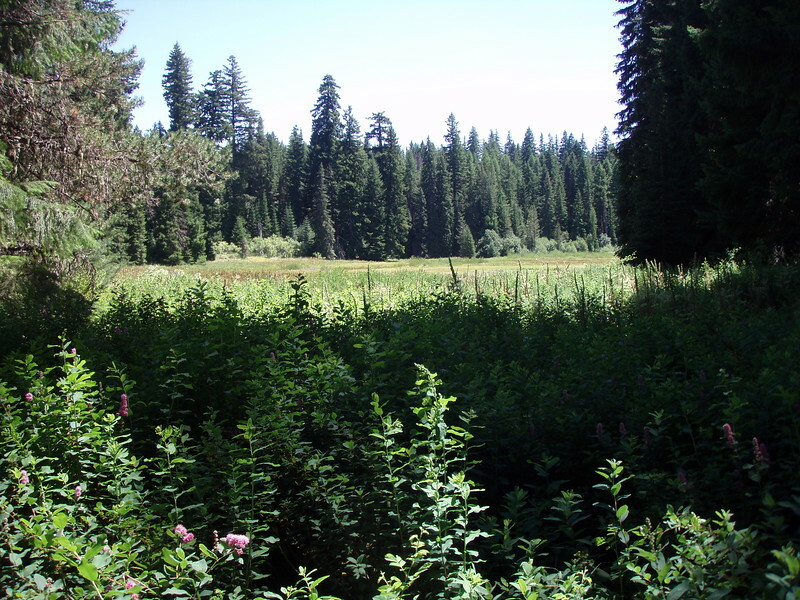 This trip was pretty uneventful as well, however it was interesting to see Clackamas “Lake” – It is more of a bog/swamp than a lake – the lake (actual standing water) is a tiny corner of the lake – the rest is just grasses and bog plants. The closer we got to the reservation, the smaller the trees, and the more sun and the warmer it became. As it became warmer, both Bodie and I got more tired. We finally got to the marker of the Reservation boundary and turned around. The trip back to the truck seemed to take longer than the trip in, but that is just because we were ready to stop hiking for a bit.